U.S. Vice President Mike Pence attends the 13th East Asian Summit Plenary on the sidelines of the 33rd ASEAN summit in Singapore, Nov. 15, 2018. “This effort will spur renewed American investment in the region’s digital infrastructure, advancing prosperity and security in Southeast Asia,” Pence said, adding that it will enhance Washington’s cooperation on cybersecurity with the regional bloc. Smart Cities is a buzzword among ASEAN member countries as they face two mega trends, urbanization and digitalization. Southeast Asian nations are rapidly increasing in population, and a large portion of their people are gravitating toward cities, creating multiple challenges ranging from traffic congestion, water and air quality, to digital security. A view of Sentosa island and the skyline of the central business district in Singapore, June 4, 2018. Singapore, as the chair of ASEAN, proposed the creation of a network of 26 Southeast Asian smart cities in April 2018. The country is known for being very innovative in terms of incorporating digital technology in urban planning, and other Southeast Asian nations are eager to emulate that success. The ASEAN Smart Cities Network is envisioned as a collaborative platform where up to three cities per ASEAN country work toward a common goal of smart and sustainable urban development that maximizes digital technology. Tan Chee Haw, Singapore’s chief Smart City officer explains the three pillars with which digital technology will improve the lives of citizens. One is the digital economy, which is about “creating a vibrant and innovative digital economy that can create new jobs, opportunities to help people and businesses.” Second is the digital government concept, to transform the way that governments deliver services that is “citizen-centric.” The third is “digital society” which focuses on ensuring all segments of the population to be digital ready and can benefit from these initiatives. The United States is still seen by the region as a leader in innovation and a natural partner in the smart cities initiative. “The most advanced technologies do come from the U.S.,” said Lim Tai Wei, senior research fellow at the East Asian Institute, National University of Singapore. ASEAN countries would like to know how “they can work with American companies and partners in order to strengthen ASEAN’s position as a network of smart cities,” he said. The partnership will offer opportunities for American companies to develop urban digital infrastructure ranging from payment mechanisms to smart transit systems. Pence said the Free and Open Indo-Pacific vision “excludes no nation.” However, a big part of the strategy is aimed to protect freedom of navigation, particularly in light of China’s territorial ambitions in the South China Sea. "We all agree that empire and aggression have no place in the Indo-Pacific," he said. Pence said the Free and Open Indo-Pacific vision “excludes no nation.” However, a big part of the strategy is aimed to protect freedom of navigation, particularly in light of China’s territorial ambitions in the South China Sea. The U.S. government will want “partnerships,” he said, and Australia and Japan are “increasing their burden” to ensure the United States is not only the one helping ASEAN’s security. The United Nations reported that two-thirds of the world’s population will live in cities by 2050. 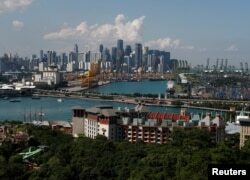 Already home to 53 percent of the world’s urban population, Asia will see this proportion expand to 64 percent by 2050. The 26 Southeast Asian pilot smart cities are Bandar Seri Begawan, Bangkok, Banyuwangi, Battambang, Cebu City, Chonburi, Da Nang, Davao City, DKI Jakarta, Hanoi, Ho Chi Minh City, Johor Bahru, Kota Kinabalu, Kuala Lumpur, Kuching, Luang Prabang, Makassar, Mandalay, Manila, Naypyidaw, Phnom Penh, Phuket, Siem Reap, Singapore, Vientiane, and Yangon. VOA's Nike Ching, Ahadian Utama and Ralph Jennings contributed to this report.